Serve your friends a pleasant April Fools’ Day surprise with this Dessert Hamburger. From celebrity caterer Andrea Correale, founder and CEO of Elegant Affairs, it’s a humorous prank that’s delicious as well! 1 Using a cookie cutter cut the brownies into circle shapes. 2 Prepare Jell-O according to package directions, chill in a shallow pan and once firm cut into round shapes using the same cookie cutter. 3 Make sweet biscuits and allow them to pose as the burger buns. 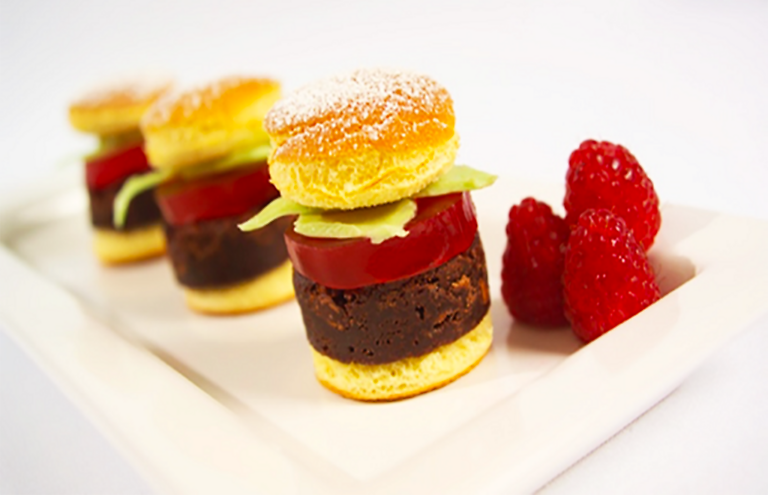 4 To assemble: layer the bun with brownie, Jell-O and white chocolate shavings on top. 1 In a large bowl, combine flour, 2 tablespoons sugar, baking powder and salt. Cut in butter until mixture resembles coarse crumbs. Gradually stir in milk until a soft dough forms. 2 Drop dough by heaping table spoonsful into eight mounds on a lightly greased baking sheet. Bake at 425° F for 12-15 minutes or until lightly browned. Cool on a wire rack. 1 Preheat oven to 350° F. In a large bowl, combine cocoa and baking soda; blend 1/3 cup melted butter. Add boiling water; stir until well blended. Stir in sugar, eggs and remaining butter. Add flour, vanilla and salt. Stir in pecans and chocolate chunks.